When we were kids, our parents let us run wild in the backyard or the neighborhood during summer vacation. But after we’d exhausted ourselves with hide and seek and other games, we’d still have to come up with creative ways to fill our time. Now in the age of 24-hour children’s TV programming and video games, it’s hard to pry your kids away from the tube or gadgets. But it looks like celebs including Halle Berry, Michelle Williams, Ellen Pompeo and Julie Bowen have figured out a way to keep their little ones engaged – and outside! 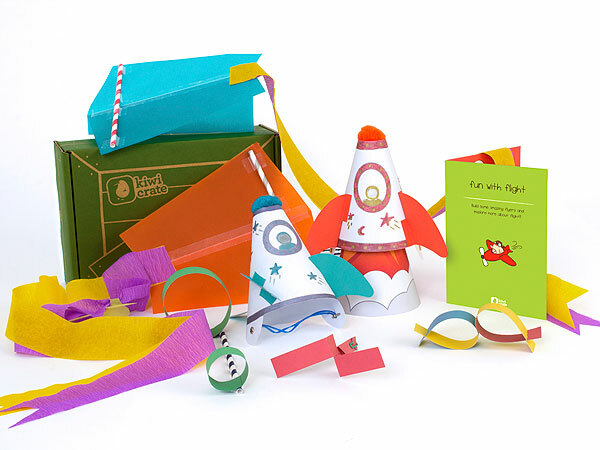 – without high-tech electronics – Kiwi Crate‘s cool craft sets. Recently, the subscription service company added the fun Summer Discovery Pack ($60) which comes with three different outdoor-themed kits. Our fave is the Fun with Flight version (below). Not only does it include a D.I.Y kite, but your kid can also study aerodynamics using mini spaceships. But what if science isn’t your child’s forte? Kiwi Crate also offers single kits ($20 each) that you can mix and match per their interests. Space Hero, anyone? Fab Sale Roundup: GILT Baby & Kids, Zulily and More! Next week, GILT Baby & Kids is hosting a few fab sales worth checking out. You’ll find loads of chic toys, accessories, shoes and clothing from Egg by Susan Lazar (11/29), Kettler Bikes and Trikes (12/2), Star Wars & Angry Birds Pajamas (12/2), Little Chef (12/4), Kidcraft (12/4), Guidecraft (12/4), Olian Maternity (12/4) Tommy Hilfiger (12/5) and more! Our picks: The Kettler 12″ Bicycle (now $98, originally $139) and the Egg by Susan Lazar Striped Knit Hat & Booties Set (now $29, originally $55), above. Hukkster Love comparison shopping? Then this online tool is for you. As you’re browsing the Web for baby items you like, you can tag them with the Hukk It pin (similar to Pinterest) and the company will notify you by email when the product goes on sale or 25 percent. Little Rue for Rue La La Next week, Little Rue is offering great sales on covetable kiddie goods including For Frill-Seekers: Girls’ Clothing & Accessories (12/7), ALEX Toys Arts Kits, Play Sets, & More (12/3), Random House Children’s Books (12/5), starting at 11 a.m. ET. Not a member of Rue La La? Use our exclusive link to sign up. My Blue Birdie This new flash sales site is carefully curated to include well-designed products new parents really need and want at up to 50 percent off. Nomie Baby Now that the seasons are changing, nomie baby’s toddler and infant stroller blankets are ideal for warm cozy strolls. For 15 percent off your entire order, enter promo code: fallnb15 at checkout. To celebrate, they’re offering our readers a 15 percent discount. Just enter code: PEOPLEMAG at checkout. Also, make sure to Like their Facebook page. Vine.com The company behind powerhouse Diaper.com has launched a brand new eco-friendly shop. You’ll find everything from organic baby food to green wooden toys. An to celebrate their partnership with non-profit Healthy Child Healthy World, they’re offering shoppers $10 off their order and free shipping. To obtain the exclusive code, go to vine.com/healthychild2002. Added bonus: Vine.com will donate $10 to HCHW on your behalf. Zulily From 12/4 to 12/7, they’re hosting their first ever sale on Bugaboo’s chic strollers including everything from the Donkey Duo to special edition Cameleons at up to $250 off plus free shipping.